Goresbrook U11's gave a scintillating display in the heat at the Gidea Park Sports ground on Thursday evening. With holidays restricting availability to just 8 players Goresbrook knew that they would have to give a solid all round performance and that is exactly what they did. Winning the toss, returning skipper Liam Elsom chose to bat on a sweltering evening, opting to open with himself and Charlie Trowell. Grace Wood and Ben Atkins were the next pair and they carried on where they left off the previous week at Hornchurch Athletic with another undefeated partnership, this time of 42 with the Essex girls U12 representative again to the fore with a hard hit 26 with 4 boundaries. Ben Atkins ensured there was not a single dot ball in the four overs faced as he scurried byes to the keeper to keep the score ticking over. Harry Ivory and Jack Gibson were more circumspect but still added 20 for no loss. An absolutely mammoth total looked on the cards when Freddie Atkins smacked 14 off an over but he was then unlucky to find a fielder when he pulled what was probably a no ball to long leg. Callum Hind looked solid in his hard ball debut. Elsom chose to bat himself and Ben Atkins again in the final pairing but found runs hard to come by against the hosts best pair of bowlers, nevertheless they added 24 with just a very tight run out decision going against them. These efforts helped brook post 339-3 adjusted down to a net 324. After enjoying the hospitality laid on by the hosts and stocking up on their fluids Goresbrook began their defence on the attack with Liam Elsom grabbing an early wicket thanks to a Charlie Trowell catch at point. Elsom and Grace Wood then targeted the stumps accurately with both grabbing 2 wickets apiece. The only down side was not finding a way to plug the gaps in the outfield to stem the flow of runs. Charlie Trowell and Harry Ivory really turned the screw conceding just 2 runs off the bat across their shared 4 overs, with both boys bowling maidens and grabbing wickets, including a smart caught and bowled from Ivory. Grace was then returned to the attack, prior to her wicket keeping duties, and proceeded to nab a further wicket and Harry likewise, was rewarded by a sharp one handed reflex catch off the edge by Freddie Atkins. 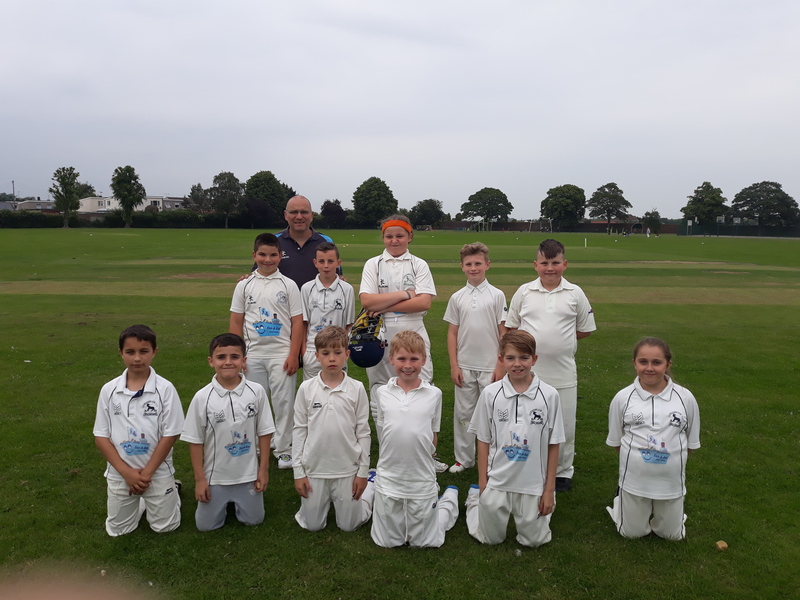 The hosts then sent out their strongest batsmen but Brook were more than up to the task as Liam Elsom brought himself back on and grabbed two wickets in the over for a maiden five wicket haul at the ripe old age of ten! Charlie Trowell then once again showed the virtue of accurate line and length bowling by grabbing two further wickets himself, one courtesy of a catch by Freddie. Callum Hind persevered despite all the shots being played and was rewarded when he gathered a smart throw from Ben and knocked the bails off. Liam Elsom then decided to cap his day with a direct hit from extra cover. The partnership had put on 41 but at a a cost of 6 wickets. The Atkins brothers then rounded the game off nicely with a brace apiece, included in which was a further catch for Charlie and a quick witted stumping from Grace. Brook took twenty wickets in total but such was their superiority in this game that even had they taken none they still would have run out winners by 7 runs. As it was the 107 run margin was hugely convincing and indicative of the confidence this young group of players have in their ability to perform. Next up is an Upminster double, home on Sunday morning and Monday evening, the true test of the team being the second game against the always formidable A team.